While the above is not quite correct, there are many improvements on the way that will allow you to reach our Nordic Lodges holiday homes faster and safer than before. Both the Icelandic Road Authority and Icelandic politician are increasingly aware of the importance of a good road network for Iceland, and the flourishing tourism depends on well-developed roads. For the last 20 years the well-known and highly praised tunnel under the Hvalfjörður fjord has served the local population and tourist alike, so we know how important such projects can be. The tunnel is a “Win – Win project” for everyone, as it shortened the ring road around Iceland by 41 km, and at the same time the old, and now rather little used, route around the fjord became a beautiful scenic road. Our guests in the great private holiday homes Brekka and Langholt benefit from this. In this quiet location you can enjoy the unique view of the Hvalfjörður fjord directly from the holiday home or even sitting in the hot tub. The busy ring road is only 9 kilometres away from the two lodges, but traffic noise plays no role in the accommodation’s relaxed environment. There are good transport connections to destinations in the immediate vicinity. A particularly worthwhile destination from our holiday homes Brekka and Langholt is the charming Glymur waterfall, 15 km away at the end of the fjord. 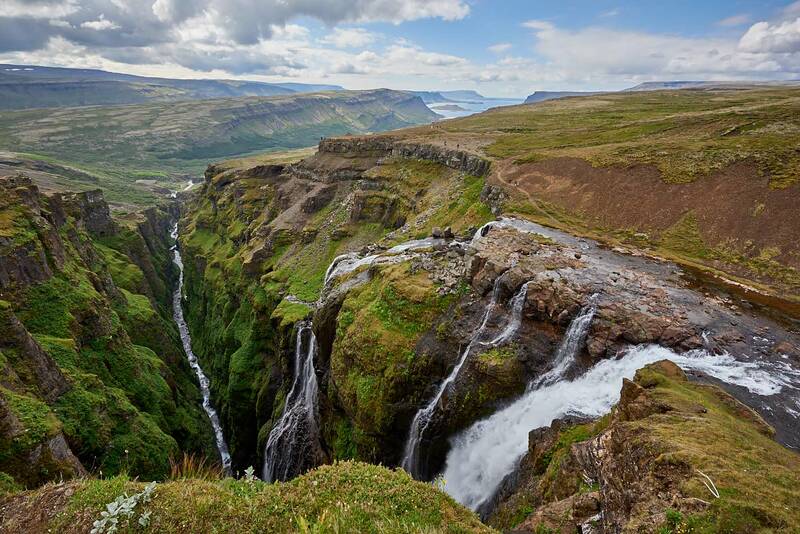 A beautiful hike leads to the waterfall, which is the highest in Iceland. Technical improvements now make it possible to reduce the work involved in road and tunnel construction, and a tunnel is currently being drilled into the mountain between Eyjafjord and the parallel Fnjoskadalur valley east of Akureyri, on the way to the natural paradise on Lake Myvatn. Construction work is expected to be completed in autumn 2018. This will shorten the ring road at this point by another 16 km. A pleasant side effect: the infamous “Vikurskard” pass, feared by drivers in winter, will no longer have to be used. This new tunnel will halve the distance from Akureyri to our magnificent Hamragil holiday home, and the main flow of traffic will shift away from the road that passes below the lodge. Even more peace and quiet, just like at our holiday home Brekka! As soon as more direct flights from Europe to Akureyri will be offered, our holiday home Hamragil can be reached in only 20 minutes driving time from the airport in Akureyri. Wondrous things are also happening in the West Fjords. After about 15 years of discussions about road construction measures in the southern West Fjords, it has finally been decided that three bridges should be built over the fjords of Torskafjördur, Djupifjördur and Gufufjördur. A sensible measure, which was obvious from the beginning. Thus, the road conditions in the southern West Fjords, where our holiday house Tvera is located, will be improved considerably all year round. The connection from the town of Ísafjördur, in the north of the West Fjords, will be greatly improved as well, making it less stressful for inexperienced drivers than before, and it will also be passable in winter. This will be primarily thanks to a new tunnel through the mountain between Dyrafjördur and Arnarfjördur that is on the drawing board. After its completion you will be able to enjoy Iceland’s best fish in the restaurant “Tjöruhusid” in Isafjördur driving over from Lodge Tvera in winter as well – the 100 km drive is well worth it! Despite all the technical progress, analyses and plans used to calculate the costs of tunnel and road construction work in Iceland, Iceland’s nature is always full of surprises. During the construction of the tunnel east of Akureyri, the construction workers on the western side of the mountain unexpectedly encountered a water vein with 50 degrees warm geothermal water. Initially, more than 300 litres of water flowed out per second, which affected the work drastically and delayed the progress. On the other side of the tunnel, the construction workers hit a cold-water vein. Due to the slope of the tunnel shaft, already about 500 meters long at that time, it was filled with water. As a result, completion of the tunnel will be about two years later than originally planned. The costs will be about 50% higher than initially estimated, but what wouldn’t one do to make Nordic Lodges holiday homes more accessible?